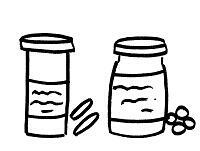 Prescription and over-the-counter drugs should never be flushed, rinsed down the sink, or simply thrown in the trash. The chemicals in medications can contaminate our drinking water and disrupt aquatic life. *Will accept liquids if sealed. Will accept bio-hazards, including syringes, by appointment only. Pharmaceuticals can also be dropped off at Recycle Utah’s bi-annual household hazardous waste events in May and October at the Canyons parking lot. For English/Spanish handout with pharmaceutical disposal options, please click here. Click for additional handouts here.